Newtown’s Latham Park remains a fortress after a 3-1 win over Llandudno Town in the Welsh Premier League in front of the S4C cameras. Goals from Steve Leslie, Neil Mitchell and Callum Roberts got the Robins back to winning ways in what was a very wet and windy match under the lights at Latham Park. Llandudno’s Matty Williams caused damage in the first half to help the Seasiders equalise but the visitors didn’t do enough to avoid a 12th defeat in the league this season. 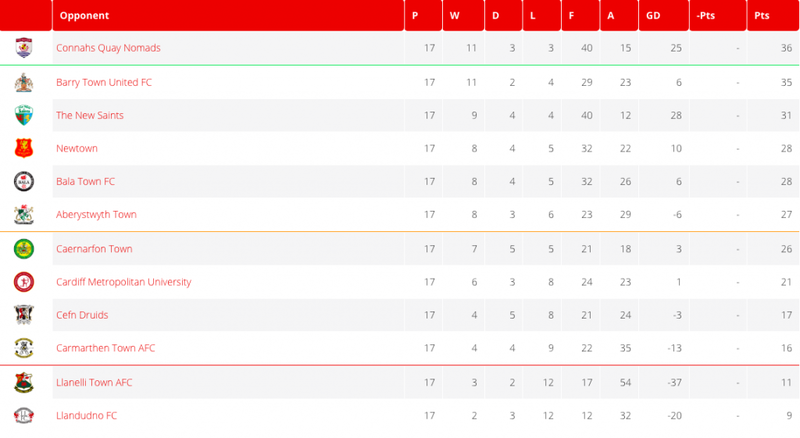 Newtown’s 8th win of the league season puts them in 4th place as the reds continue to fight to finish in the top six before the division splits in January. Newtown manager made two changes to the starting line-up that lost at home to Rhyl at last weekend’s Welsh Cup as Luke Boundford and Callum Roberts stepped in for Jake Cook and the departed Ben Bailey who rejoined Hednesford Town earlier in the week. 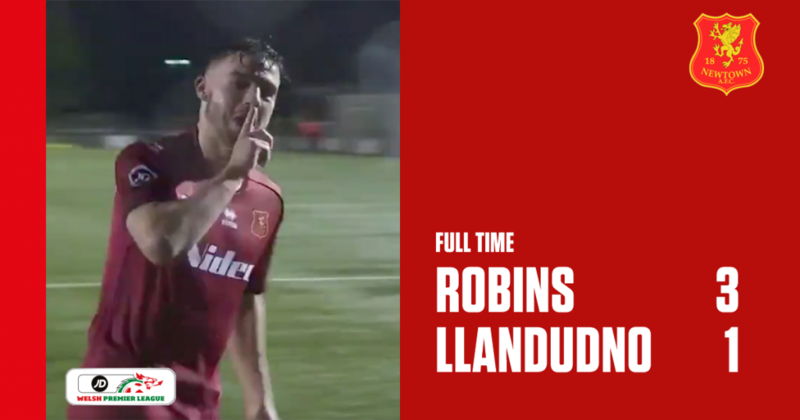 Llandudno got the game underway and as the game had only been a couple of minutes old, the Robins appealed for a penalty after Callum Roberts had gone down in the opponent’s box but the referee, Gavin Townsend, gave Roberts a yellow card for diving. 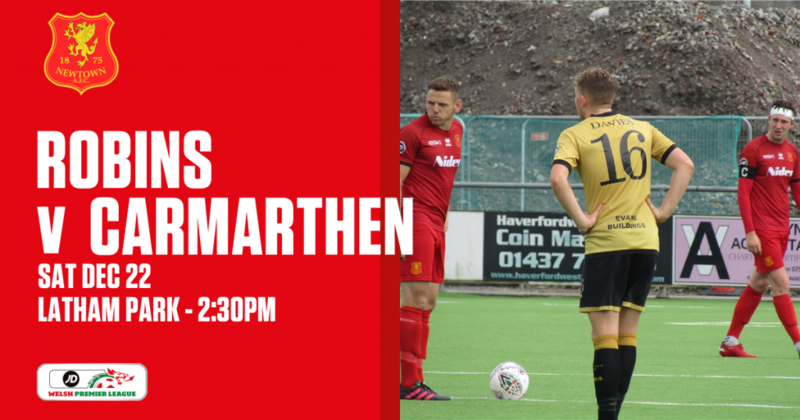 Straight from kick-off the winter weather setup an interesting Welsh Premier League encounter as high winds and fast rain made the game just a little more unpredictable. Before the game reached the 10th minute mark, Nick Rushton picked up a forward pass Neil Mitchell to have a crack at goal but the winds lifted the ball too high for the target. After the first quarter of an hour, Newtown went on the attack as Mitchell delivered a great pass to pick out Luke Boundford who unfortunately missed the net from close range. But it proved his attempt didn’t matter as he was caught offside. 5 minutes later and Newtown were awarded a penalty after Mitchell was forced down in the Llandudno danger zone. Steve Leslie stepped up to the plate and showed no pressure by making the Llandudno goalkeeper go the other way in order to open the scoring. The visitors started to show some response after conceding as the build-up were signs for Newtown to be careful. Llandudno put the game back level after 30 minutes when former The New Saints player, Matthew Williams, intercepted from a half headed clearance and placed his shot into the top corner of the net. 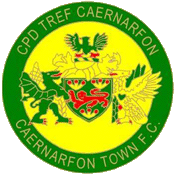 The Seasiders then carried on the momentum by growing more confidently in the first half, as 10 minutes before the interval saw Alun Webb come in from the wing to then rifle his shot which would just miss the target. Seconds later on the opposite end of the pitch, Boundford nearly put Newtown back into the lead with a low shot on target which took a deflection on the way but Connor Roberts saved well to keep it at 1-1. Just before the first half had come to a close, Mitchell had a golden opportunity with a free header from a corner delivery who was disappointed not to convert it home. There were no substitutions during the half time break. It would only take Newtown 10 minutes in the second half to get themselves back into the lead when Mitchell headed the ball home thanks to a wonderful cross from Sam Phillips. Yet again Newtown’s lead was challenged just moments after their second goal when goalkeeper Dave Jones made a terrific save from Mark Connolly’s free kick. But the reds stayed cool under pressure and went on to put the game to bed when the return of Callum Roberts made it 3-1 by hitting the roof of the net and arguably scoring the goal of the night. Llandudno’s goal scorer, Williams, picked up a nasty shoulder/arm injury 17 minutes before the final whistle and was then substituted. Newtown were able to keep the scoreline healthy and crossed the finish line with three goals and three points. Newtown AFC: 1. D. Jones (GK); 3. C. Roberts, 5. K. Mills-Evans, 6. J. Denny (C), 7. N. Mitchell, 8. N. Rushton, 9. L. Boundford, 10. S. Leslie, 11. J. Kenton, 17. S. Phillips (14. E. Jones 87′), 23. A. Fletcher. Substitutes: 13. J. Perry, 14. E. Jones, 16. G. Cadwallader, 24. J. Cook. Llandudno: 25. C. Roberts (GK); 8. D. Hughes (C), 11. S. Thomas (16. B. Clark 84′), 6. K. Edwards, 4. M. Pearson, 7. M. Williams (10. G. Harry 74′), 19. Z. Edwards, 5. L. Smith, 14. A. Webb, 18. M. Connolly, 21. T. Jones. Substitutes: 10. G. Harry, 1. S. Pearson (GK), 16. B. Clark, 17. T. Williams, 12. A. Hughes.